Cabo San Lucas is one five main locations in Baja California Sur – which include La Paz, San Jose del Cabo, Todos Santos and Loreto. All of these places can be discovered with Mexperience. Cabo San Lucas – ‘Cabo‘ means cape – is at the far tip of Mexico’s Baja Peninsula, the land immediately south of California in the United States; it is cut-off from mainland Mexico by the Sea of Cortez, also known as the Gulf of California. This region of Mexico is a real paradise, with its hot deserts, breezy oceans and cool waters reflecting several different shades of blues and greens. The region is a particular favorite with divers, golfers and people looking to take part in sports fishing excursions. Like many of Mexico’s thriving beach locations, Cabo San Lucas was a quiet fishing village before it was developed. Today, Cabo is an elite party town on Mexico’s Baja California Sur coast; luxury hotels, trendy bars, restaurants and night clubs are everywhere. 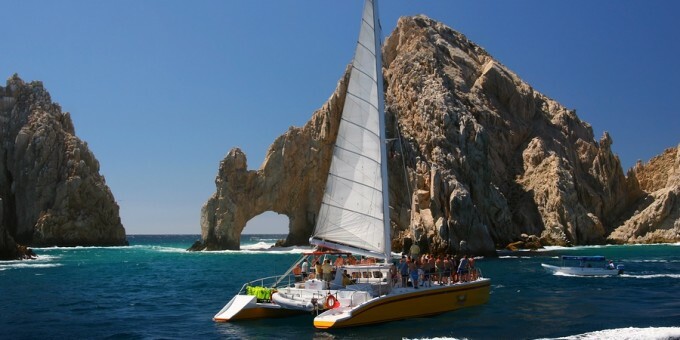 Cabo attracts people looking for relaxation, water sports and golf. Golf has taken off here in recent years with the development of some of the world’s finest golf courses and near year-long perfect weather for golfing. If you want to experience a getaway destination that promises luxurious relaxation just across the border, then Cabo San Lucas could be just the place you’re looking for. Cabo San Lucas has a great ‘principal’ beach – called Medano. You can rent snorkeling equipment and non-motorized water equipment right on the beach. This is a good place to sunbathe and swim as well. Farther out of town, you can find some remote beaches along the shoreline between “the two cabos” (Cabo San Lucas and San Jose del Cabo). These include the Barco Varado, Chileno, Palmilla, Santa Maria and Vista del Arco Beaches, for those who want to get away from the crowds and see some stunning beaches and shoreline. You’ll need to rent a car – see Getting Around, below. The local ecology, the landscape, the climate and the proximity to the sea make this region a paradise for those who love nature. What’s more, you can find experienced and well prepared organizations in Los Cabos who are ready to help you enjoy the best of what this region offers. With its calm waters, fine weather and beaches, it’s no wonder that water sports are one of the main attractions in Cabo San Lucas, including snorkeling, SCUBA diving, kayaking, water and jet-skis. If it’s water based, you can experience it in Cabo San Lucas. See Also: Water Sports in Mexico. Los Cabos is one of Mexico’s top destinations for sports fishing. See Also: Sports Fishing in Mexico. Cabo San Lucas is host to some of Mexico’s finest resort spas. For more information about spas and how to benefit from a magnificent health spa experience in Mexico, connect to the Mexperience guide to Spas in Mexico. There’s no better way to enjoy the scenery in this area than on a local boat cruise. Local cruises take you on tours around the many islets surrounding Baja California Sur, and include sunset cruises that let you experience some of the most wonderful sunsets you’ll view in your life. The climate in Baja California Sur is ideal for golf all year-round, and the region is fast becoming one of the top places in the world to play the game. Baja is host to some of the world’s finest golf courses and many people visit the area simply to enjoy great golf in Mexico. By Air – You can get to Cabo San Lucas by plane from Mexico City, Guadalajara, Tijuana, and various places in the USA, especially Los Angeles, CA. The same airport that serves Cabo San Lucas serves San Jose del Cabo, although it is closer to San Jose del Cabo. Taxis and vans are available from the airport; to save time and secure your space, consider pre-booking a shuttle so that someone is there to meet you at the airport when you arrive (see Airport Transfers, below). For detailed information about flights and flying, see the Mexperience guide to Air Travel in Mexico. By Car – Driving to Cabo San Lucas from the southern border of the United States will take you about twenty to twenty-four hours on Highway 1 and then a further two hours on Highway 19. See additional information about Driving in Mexico and Mexico’s Toll Roads on Mexperience. Local Bus – If your budget is tight or if you want to see more of local life, local bus service are available which connect La Paz, Los Cabos and Todos Santos as well as other destinations further north such as Loreto, San Felipe and other destinations in Baja California. July: Every July you can experience the Cabo Jazz Festival in Cabo San Lucas. Link to festival’s official web site at www.cabojazz.com for full details. October 18th hosts the festival of St Luke’s Day – the Patron Saint of Cabo San Lucas (which means “Cape of Saint Luke”). Expect lots of dancing in the streets, music and specially arranged local events to mark the day. Exchanging Currency: Banks with ATM machines can be found in the downtown area of Cabo San Lucas. During business hours, they and the Casas de Cambio will buy travelers’ checks and cash from you as well. For detailed information about exchanging and managing your money, read the Mexperience guide to Money in Mexico. Beach Safety: The main beach, Medano, is a safe beach to swim from, and areas of the nearby water are roped off to protect swimmers from motorized water craft that operate in the area. Keep an eye on the surf and monitor weather conditions—especially in September when the weather in the region is changeable. Mona Lisa: Located near the entrance to the town, this is a great place for cocktails and to watch the beautiful sunsets that are among the best in Mexico. As one of Mexico’s elite party-towns, Cabo San Lucas will offer night owls a feast of bars, restaurants and night clubs that will keep you dancing all night long. The night clubs don’t get going until around midnight and don’t stop until the sun rises the next day. If you want to dance and swing, quite literally until the sun comes up, then Cabo San Lucas will deliver the experience you’re searching for. Remember that you’re at land’s end on the Pacific Coast. The sunsets you’ll see from here are absolutely terrific, so make sure that you’re near the coast around dusk. Between January and March, you may also watch the whales in the water as the sun goes down – a spectacular experience. Shopping is a major pastime in Cabo San Lucas. All of the shops are within walking distance (as are most other things in Cabo San Lucas). You may ask the shop to have your purchase delivered back to your hotel, especially if it is a bit big or fragile, or if you are just starting an active day of bargain hunting! The weather during the summer months will be extremely hot; cooler near the coasts. In the winter it can get cooler and windy. 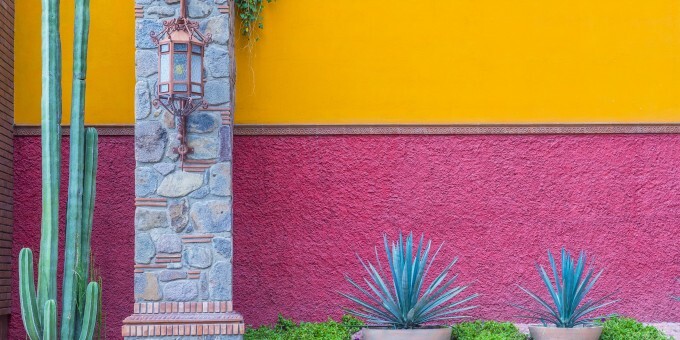 The rainy season is September (the one month when the weather can be changeable), otherwise this part of Mexico enjoys sunshine most days of the year.